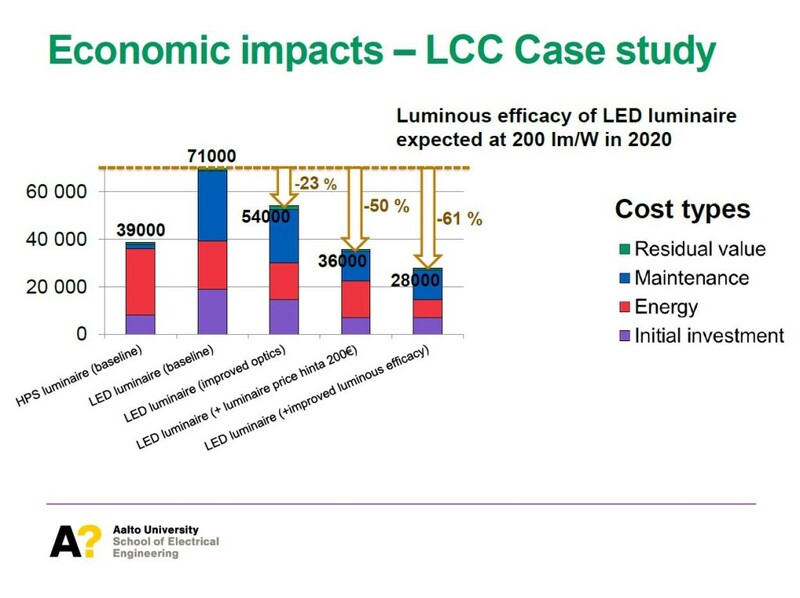 At a recent seminar on the lifecycle of LED, facilitated by the International Institute of Industrial Environmental Economics at Lund University (IIIEE), we asked post-doctoral researcher Leena Tähkämö from Aalto University in Finland to give us her insights into some of the industry’s most discussed & debated issues right now. Q: When do you estimate that outdoor LED products will seriously rival traditional lighting products in terms of upfront/initial investments? A: In my opinion, the best way to compare the costs of traditional lighting solutions with those of LED lighting is to calculate the overall costs during a longer period of time. These life cycle costs, or total cost of ownership, are more descriptive for the economic evaluation than the initial investment, especially in outdoor lighting that typically is designed to operate for decades. The life cycle costs of LED lighting products already start to be in the range of those of the traditional ones, and in cases, they may even beat the traditional ones. If you want to look at only the initial investment, the purchase prices of LED outdoor luminaires have decreased a lot over the last few years and the price difference in the purchase price per luminaire is not that dramatic anymore. The energy costs during operation tend to be lower for LED luminaire due to their higher luminous efficacy compared to conventional luminaires. Q: In terms of the impact on the environment, what is the single most important action commissioners of outdoor lighting should take? A: If you want a quick fix, I would recommend focusing on luminous efficacy (lumens/watt). The higher the luminous efficacy is, the lower the energy consumption and the respective CO2 emissions are. This is the single most important issue based on the environmental analyses. Bear in mind that in case of outdoor lighting, such as streets and outdoor areas, the luminous efficacy must be evaluated together with the number of needed luminaires. In addition, make sure that the luminous flux serves a purpose and do not waste the lumens when and where they are not needed, e.g., towards the sky. Q: What, in your view, will be the biggest development in the lifecycle of LED over the next 5 years? A: I’m not anticipating anything “major” to happen in 5 years in the LED technology. The purchase prices continue to drop, as the technology becomes more mature and patch sizes grow. The luminous efficacy of LED lighting products will also continue to be developed. Instead of one dramatic development, I’m looking forward to continuous improvement of LED products in terms of luminous efficacy, functionality and purchase price. With more energy-efficient, less expensive LED lighting products, we can achieve good quality of lighting. It will also be interesting to see the benefits of connecting lighting to other systems, in combination with IoT networks, and thus create truly smart systems. 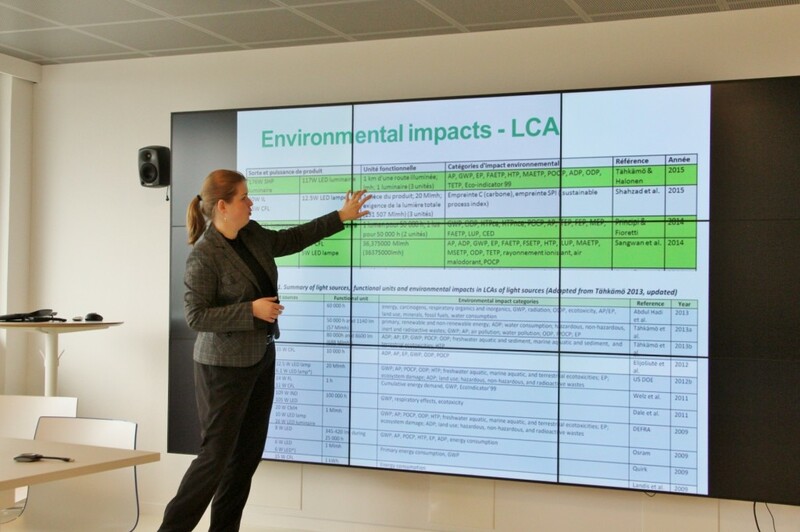 Leena Tähkämö is a post-doctoral researcher (doctor of Science (Tech. double degree), at Aalto University, School of Electrical Engineering, department of Electrical Engineering and Automation, Lighting Unit.